You are here: Home / Adam in the Media / Awards and noms / Vote Adam Lambert – TV’s Greatest Music Star of All-Time! 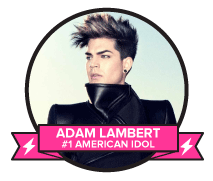 @adamlambert’s in another one of those polls – and we can’t resist promoting a win for him! This time, it’s to be named TV’s Greatest Music Star of All-Time! He’s made it through the first few rounds, knocking off Kris Allen in Round Two. 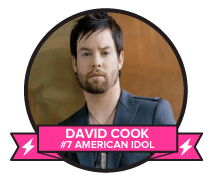 As of this writing, he’s leading 62%-38% in the head-to-head with David Cook, the Season 7 winner of American Idol. Voting closes at 9 AM EST Monday morning. Staying positive, Round Three quarter-finals will pit him against the winner of the Jordin Sparks/Leona Lewis match. You can vote over and over. It’s even kind of fun because every time you vote, you see how many more votes have been cast in just the last 5 seconds. Cook’s votes are going up too, so we have to remain diligent. Let us know if you changed the percentage! Check out the poll here. To see the whole voting sheet, click on the pink headline above the ballot. I’d also like to take this time to publicly thank Lila for all the hard work she did on the re-creation of this site when we became the new owners. This started out as a wild dream and she made it happen. She is incredibly dedicated to you and this site, and worked many nights and weekends to make sure all the technical miracles happened. She dealt with the glitches that put us one step forward and two steps back, and has really produced a beautiful website for us to share Adam Lambert with you. This site is extremely important to both of us, and while my contribution may be more visible, without her technical expertise behind-the-scenes, this site would never be here. And we both love our readers too! Thank you for sticking with us so long and supporting us through this transition! Aw, you’re too sweet. Love you too! Lila & Carol, I TRULY appreciate you both. The website not working for a few days had me in a bit of a panic. So glad to see you’re up and running. Your news tidbits on my favorite Glamtastic man put a smile on my face each time. Thank you from the bottom of my glittered heart for all your hard work. Glamtasic cyber hugs to you both!! There was a bit of downtime during the transition, but it was all worth it!!! I’m really a PROUD GLAMBERT and so thankfull to getting know all of the amazing, dedicated fans like both of you Lila and Carol. Thank you for always keeping us informed about the greatness of Adam Lambert, spreading love and joy all over the world. You ROCK! Hi Carol, Do I have to sign up on something before my vote registers? When I click on the “vote” button above Adam’s picture, nothing happens at all. How do I know if it’s working? Thanks very much!! I don’t remember registering for the site, but I just went to look at it and it seems voting is over. Yes, it’s over and ADAM WON ! I think he will now be paired with someone else for the next round. Go, Adam !